German engineers from Koenig & Bauer Group (KBA) are putting the finishing touches on the new KBA 145 Rapida large format sheetfed offset press at Centrum Printing’s headquarters in Chipping Norton. 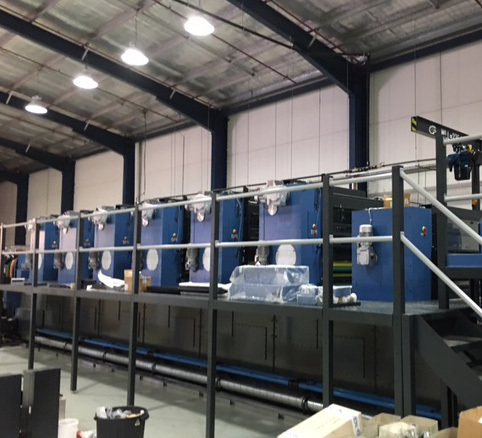 Centrum bought the six-colour KBA Rapida with UV coater and extended delivery at the drupa 2016 show in June and the massive press arrived in Sydney last month. “We had a total of nine containers to unload and the local KBA engineers have put it together piece by piece like a giant jigsaw puzzle,” says Sandra Mascaro, Centrum MD. “The assembly and testing is all coming together nicely and, touch wood, the process has been very smooth so far. It’s just a great piece of engineering work and obviously, the Germans do it best. “We’ve segregated one half of our factory to house the new machine so the installation hasn’t interfered at all with our existing production schedules and we’re still running three shifts, 24 hours a day, five days a week. The Rapida 145, with a sheet size of 106cm x 145cm, will sit alongside a large format KBA 162a installed four years ago as Centrum launched an expansion beyond commercial print into packaging and display. It will be fed by Fujifilm thermal plates imaged on a Screen PlateRite Ultima 2400 VLF CtP installed when the KBA 162a went in. Mascaro says the Rapida 145 will boost the company’s capabilities in the growing packaging and point-of-sale sectors and make Centrum more competitive in the commercial printing. Centrum Printing, established 25 years ago, is a family owned and operated company.